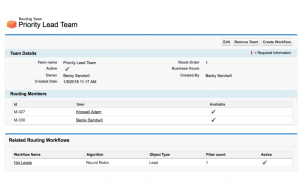 In this blog, we’ll show you how you can setup a reassignment workflow with Power Router. Power Router lets you associate custom SLAs with your routing workflow which ensures that a lead is reassigned to a different rep if the SLA is not met. 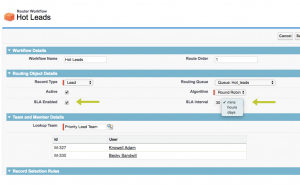 This article walks you through how you will set up a custom SLA for your lead distribution. Note: Before beginning ensure SLA assignment is enabled for your Org. If you don’t see SLA related fields in your workflow, contact support@ziguar.com to enable them. Use case: Let’s say you want to route incoming ‘hot-leads’ to a few senior reps in your Org and have them start working on the lead them within 30 minutes. If the lead has not been reached out by the Rep, it should be reassigned to the next Rep in the workflow. We’ll first create a team called ‘Priority Lead Team’ and add Reps to the team. 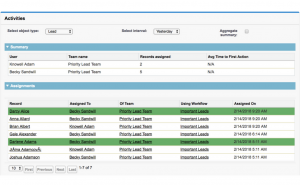 Next, we’ll create a workflow for this team and configure SLA related fields. Enable SLA for the workflow by clicking the checkbox. Leads would get reassigned if the lead has not been read by owner within the SLA time period. This is a salesforce standard field (IsUnreadByOwner) on the lead object which gets updated when the lead owner views the lead. After the workflow executes, any leads who have not been read by their respective owners would get reassigned to the next person in the team. A reassigned lead will not be assigned back to the previous owner. You can see all the reassigned leads in router activities. All the leads which are reassigned are color-coded as green. SLA time period should not be too large as it may cause unread leads to get accumulated which could affect power router performance.